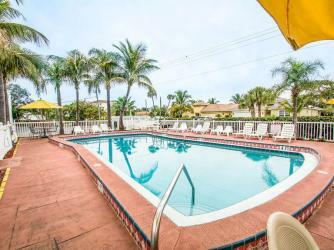 Econo Lodge Cocoa Beach is a family owned and operated motel located in the heart of Cocoa Beach. The owners take pride in paying attention to the tiniest detail and it shows! With 44 units split over two floors, this beachside motel is conveniently located near local attractions such as the beach, Port Canaveral, Kennedy Space Center, Ron Jon Surf Shop, Cocoa Beach Pier, and Merritt Island Wildlife Refuge. Free breakfast for registered guests at Sunrise Diner off property. Children under 12 free. Outdoor Pool (not heated). Backyard "BBQ" area featuring grills & lounge chairs. Guest laundry and vending machines. Snooze & Cruise packages are available. The Econo Lodge Cocoa Beach's Snooze & Cruise Package includes free breakfast, complimentary parking while you cruise, local shuttle service to Port for a fee, 15% discount at Ron Jon's Surf Shop, free bowling passes Shore Lanes. Special room rate based on availability.